In case you thought we’d figured out life in the oceans even a little bit, a new study published in Nature Communications sets the record straight. For the first time, scientists have found experimental evidence of underwater pollination. There are bees in the sea—or at least creatures that perform the same kind of work. 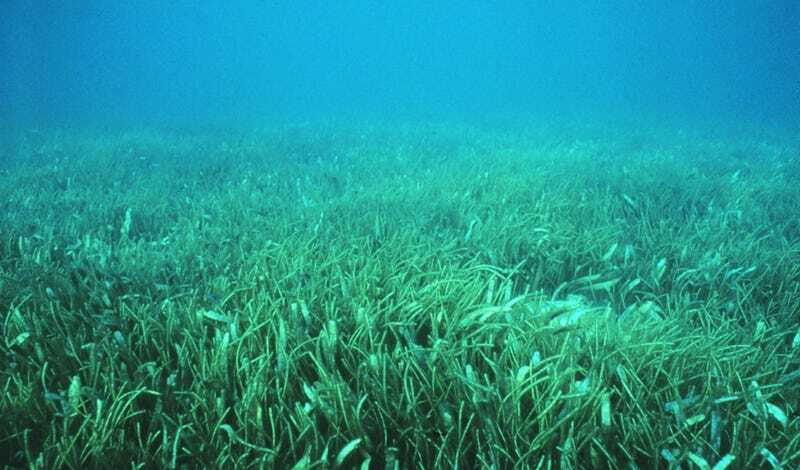 Microscopic crustaceans and tiny marine worms help pollinate a tropical seagrass called turtle grass (Thalassia testudinum), according to research led by Brigitta van Tussenbroek at the National Autonomous University of Mexico. Several years back, van Tussenbroek and her colleagues captured video footage of these tiny invertebrates swarming about turtle grass beds like bees on flowers. In particular, the animals were drawn to male flowers, probably to feed off carbohydrate and protein-rich pollen. As a side effect of this feeding behavior, they appeared to ferry pollen from flower to flower. The finding was such a surprise—until then, it was thought that seagrass pollen traveled from male parts to lady parts on ocean currents, with nary an animal to assist—van Tussenbroek and her colleagues decided try and replicate pollinator behavior in the lab. In the new study, the researchers added marine invertebrate-rich seawater to aquariums containing flowering turtle grass, sat back, and watched what happened. Sure enough, within a few minutes, extra pollen grains started to appear on the sticky, tentacle-like stigmas of female flowers, compared with control tanks that lacked the wee animals. Water, mind you, is still an important medium for spreading turtle grass pollen, but invertebrate pollinators probably enhance the plant’s reproductive success. It is thought that marine flowering plants evolved from freshwater ancestors, most of which flower above water and spread their seed via insects and the wind. It seems logical that a mixture of abiotic and biotic pollination would have carried over to life in the ocean. That said, we still have no idea how common underwater pollination is—the study, after all, only looked at a single species. Worldwide, there are sixty known species of seagrass. They form vast meadows in shallow temperate and tropical marine waters, providing habitat to a diverse array of fish, invertebrates, turtles and manatees. Turtle grass pollination may be the exception. Or, sea bees could be incredibly common, eluding our detection simply because we never bothered to look.